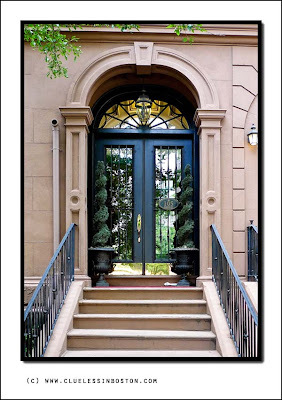 This week's doorway can be found at 105 Beacon Street. Very smart and elegant; The two trees give the final touch! A very 'grand' entrance to what is probably also a very 'grand' building. Very chic! The plants are amazing. Don't you wish you had the key to that door? Spectacular! I imagine the pipe on the left to be a periscope to watch the comings and goings. I need more rest. Very nice! I do like those manicured trees on each side. Such a charming insight into the garden behind the door. The topiaries are wonderful! Very grand doorway. Its making a statement! That gives new meaning to the phrase, "Grand Entrance"! Beautiful doorway and beautiful shot!